Twitter brought hashtags to the attention of the cultural masses, and it feels like hardly an hour passes now without seeing a hashtag plastered across a billboard, movie trailer or TV commercial. However, on Twitter itself, one of the biggest problems with any single hashtag can be figuring out what it actually means. Something like #happy is pretty clear, but what does #rt usually stand for – retweet? Actually, it’s commonly used for the TV network Russia Today, and it’s exactly this sort of confusion that Twitter hopes to clear up with one of its current experiments: hashtags that explain themselves. First spotted by the The Wall Street Journal in the official Twitter for iPhone iOS app, the feature adds an extended label to a hashtag search that identifies its meaning to the end user. 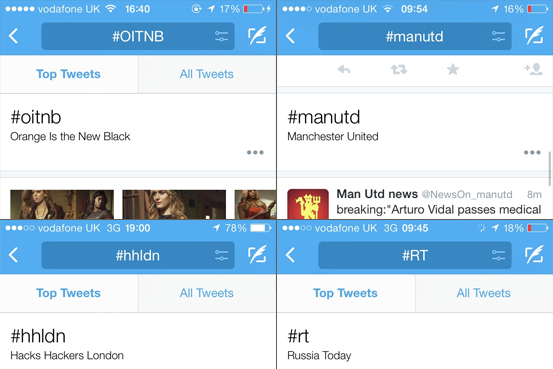 In the example in the visual below, #oitnb, #manutd, #hhldn and #rt are all translated. The Journal notes that #lol was also translated as League Of Legends, as opposed to “laugh out loud”, but #smh was identified by Twitter as “shaking my head”, as opposed to something like The Sydney Morning Herald (for example), so there’s certainly some discrepancy in the agreed meaning of a specific hashtag. Twitter does these sorts of experiments all the time and few of them actually become core features. However, understanding hashtags has always been an issue for newcomers to the platform and one would presume Twitter was trying this implementation to help with that process, so there’s a good chance that, once perfected, this could be rolled out to all users.